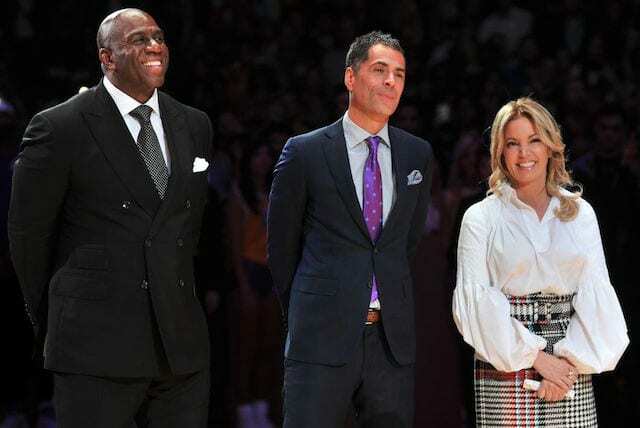 During the 2016-17 NBA season, Los Angeles Lakers owner and president Jeanie Buss made an extremely difficult decision to take drastic action and overhaul the front office by hiring president of basketball operations Magic Johnson and general manager Rob Pelinka in charge. While the previous regime was able to establish a young core through the NBA Draft, they could not sign an All-Star-caliber player to speed up the rebuilding process. Instead, they signed Luol Deng and Timofey Mozgov to four-year deals worth a combined $136 million. In less than two years, Johnson and Pelinka have completely changed the outlook of the storied franchise. Highlighted by signing LeBron James in this summer’s free agency, the Lakers will also have a projected $38 million in cap space for 2019 free agency, which should feature Kawhi Leonard and others. Although there was optimism when Johnson and Pelinka took over, Buss recently mentioned that they have exceeded expectations heading into the 2018-19 season. From a team that had two of the worst contracts in the league and no draft picks as a result of the Dwight Howard and Steve Nash trades, it has been quite the turnaround. However, the Lakers understand the job is not finished until they win their first championshiip since the 2009-10 season. I love that picture of the 3 of them. Every time Jeanie is with Magic and Rob she looks really happy. I'm savoring every moment of this. 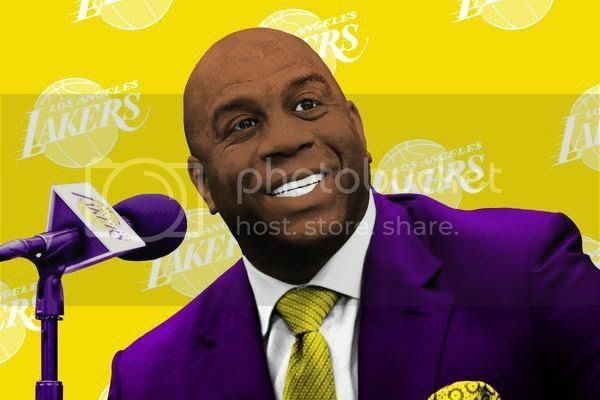 I don't see Magic sticking around for long after the turn around is complete, he is overqualified to be President of Basketball Operations. I just can't believe we went from being a bottom tier team for years to at worst being a 4th seed in the West. If we luck out and draw San Antonio in the 2nd round somehow I feel good about winning that series, Derozan ain't that great. So appreciate the Magic while it's here. We're entering the twilight of the Lakers era. The season hasn't even started yet. I honestly think that we get Bron and draft Ball either way. Maybe no Bron with Jim Buss and Mitch and i thought they were rebuilding ok besides mosgov and deng contracts. i think a lot of people were concerned when rob was hired as GM, thinking perhaps it should have been ryan west...i know it hasn't been that long but i don't think too many people can complain at this point. There were also people that felt they NEEDED to hire Jerry West back as well. Sometimes you have to start afresh and stop handcuffing yourself to the past. Hiring Magic/Rob and going fwd with their plan and views is best and it's working. I wouldn't praise them so quickly. We aren't even a favorite to win the West on paper. Lots of work to do. The difference in #3-#10 in the playoffs last year (West) was about 3 or 4 games. Im willing to bet that this team is much better than last year's 3rd seed in Portland. The West was tough last year b/c 3-10 weren't elite. I still say that if LA was the team they were from January on to start the season they wouldve been in the playoff mix last year. I hope you're right. Most important move was landing LeBron. WIthout that, the other poves would have been seen as a failure. Remains to be seen if they got it right. Randle and Lopez were a huge part of what this team was last year. I wouldn't make any predictions based on last year without them. That statement was assuming we ran the same roster back. Every additional signing was b/c of Lebron. If they dont sign Lebron it's very likely they resign Randle. I dont see them bringing in a player like Lance or Beasley w/o Lebron to normalize things. I have every reason to believe this team will be a contender this year, mostly b/c of Lebron but also b/c of how the other guys will fit WITH him. I dont think some people realize how great of a fit this team is. The only thing in question is the consistency in 3 pt shooting. Ingram found his 3ball last year albeit it low volume he was hitting. If Lonzo shoots 3s at an average percentage on the volume he had last year this team is easily a top 5 team in the NBA. All the right reads and actions we wanted to see from Randle offensively Lebron is pretty much going to make those. Randle was great once he started but his attention to court detail is part of the reason why he's not here. It was year 4 and he made strides but future stars dont make the mistakes he was making in year 4. He's going to continue to be good but I believe he'll always be one of those if he just did this or that he'd be a star. I think the playmaking ability from Lonzo, Ingram on the floor with Bron will maximize Lebron's off ball ability. Gotta go watch some of the Heat games to get back used to how Lebron did things then when he played more off ball than in CLE. My inspiration, my role model, my hero. Mr. against-all-odds, overcame adversity, Mr. $500M, Mr. President. Edited by dbtbandit67, September 22, 2018 - 07:37 PM. If he turns into another KG during the days in Minnesota shortly before he joined the Celtics, he will want out. It's not a matter of IF, it's a matter of when. If I were him I would do things the proper way, play out the rest of his contract (repay the city and franchise that gave you all that money, finish out your contract) and let the organization know upfront that you plan on leaving them as an unrestricted free agent UNLESS there is a cohensive plan to stockpile on assets and free up cap space, and at least have somewhat of a shot at B-grade free agents. Give them the opportunity to make the decision on whether they will take the risk in attempting to resign you with a plan to become a contender, if they decide to trade you to a team willing to take the risk of giving up assets for a chance to sign you, then so be it. Edited by dbtbandit67, September 22, 2018 - 07:50 PM. Magic & Rob have done a solid job since their arrival... they were given a pile of s--- and have turned things around nicely.